Professor Asmi Bishara is founder of the Arab Balad party in the Knesset. Here is a clip of him admitting that there never was such a thing as a Palestinian nation. He is of course not as knowledgeable as the BBC's Jeremy Bowen and his fellow media hacks. For them, such facts must never get in the way of a good story. Especially when it has the extra bonus of being anti-Semitic. Demonising Jews and their state always makes for great TV ratings. Much the same as Big Brother and the raft of other voyeuristic shows which cater to the same mass audiences of sickos. Well, I don’t think there is a Palestinian Nation at all. I think there is an Arab Nation, I always thought so and I didn’t change my mind. I don’t think there is a Palestinian Nation, I think it’s a Colonial invention Palestinian Nation. When were there any Palestinians? WhatI think there is an Arab Nation; I never turned to be a Palestinian Nationalist, despite of my decisive struggle against the Occupation. I think that until the end of the 19th century, Palestine was the South of Greater Syria. I mean no personal disrespect to you but feel impelled to write and express my outrage at the sullying of the illustrious Rothschild name and lineage by your son’s association with the Gadaffi family. As a Jew and a committed Zionist I have always been aware and immensely proud of the achievements of the Rothschild dynasty and its contribution to my people and its state. But to see the next generation openly socialising with such rabidly anti-Semitic and murderous despots truly sickens me. For our people, no amount of commercial profit or dividend can possibly justify such associations. By what right does young Nat presume to trample and trash a reputation built up over centuries of professional excellence and communal endowment? It truly saddens me to the core. I hope you share the same sentiment … and perhaps enough shame to do something about it. 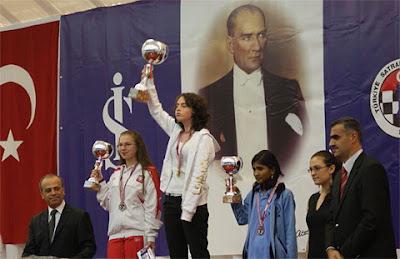 Marcel Efroimski, a 13-year-old Israeli chess prodigy, yesterday became the Girls' Under-14 World Chess Champion when she won the Gold Medal for her age group at the World Youth Chess Championships held in Turkey. Turkish authorities refused to play the Israeli National Anthem, as is required at such ceremonies. However, young Marcel would not play the dhimmi. She stood on the podium and raised her trophy with an expression of defiance. My cousin Marc sent me an invitation to his son's barmitzvah. He added these stamps especially to my envelope - 'to get a raise (reaction) from me'. My reaction is: will the USA not learn the lessons from Europe? 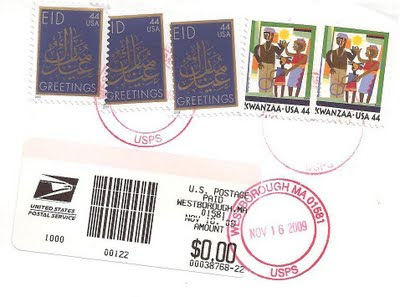 Eid is the Muslim commemoration of their patriarch Ibrahim's willingness to sacrifice his beloved son Ishmail to God. In actual fact it was Abraham and his beloved son was Isaac. But, as we have come to learn, the truth means very little to Islamists. And America needs to beware that this kind of inversion of history, is but a small step from the inversion of America's future as a free nation. This outstanding speech by the incredibly brave Dutch MP Geert Wilders needs to be circulated widely. A story of our times. What do you bet that the Australians will have a better way of dealing with this problem than the British or Europeans - for whom sadly it is far too late anyway. Obama should apologize to the Hasan family on behalf of the US military for hurting Malik's feelings and driving him to this terrible deed. The President - between bows to Saudi Arabian despots - has assured us that Islam is a religion of peace whose people share the values we hold dear in the West. 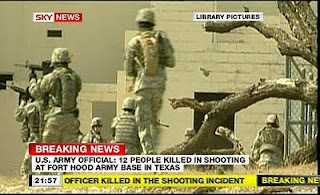 What better example than the events at Fort Hood? I'm sure that CAIR will provide a top lawyer to get compensation for Mr Hasan's loss of earnings while hospitalised and unable to work through later disability. The policewoman who shot him down should also be sued. Hers was an overreaction and a blatant case of racial profiling. This incident only goes to show how vitally important it is for the Obama administration to continue to stay totally focused on Israeli settlements which are so obviously the root cause of what happened at Ft Hood. Just like after 9-11, I will eagerly await speeches from the world's leading Muslim clerics and rulers of Arabia condemning this act of butchery without reservation. So far it's been 8 years waiting. Iran defied the world today in rejecting even the sham of a settlement plan watered-down by Mohammed's IAEA which would have enabled them to enrich weapons grade uranium under the noses of the inspectors. The cheek and temerity of Ahmadinejad's regime - in terms of both nuclear arms and civilian repression - is only a reflection of the dithering of self-interested European governments and the utter spinelessness of the new American president. 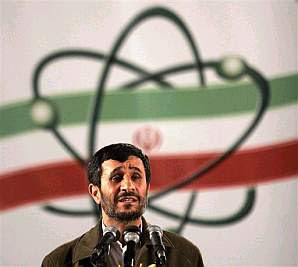 Sitting atop his new atomic stockpile, Amadinejad mocks the West - referring to them as nothing more than 'mosqitos'. Islam spits on Obama and he insists its just raining. It simply defies belief that in little more than half a century since the end of the second world war, the world has forgotten the lessons of Hitler whose sole mistake was - as Netanyahu reminds us - to develop atomic weapons towards the end of his campaign, instead of in advance. Ahmadinejad has clearly learned the lessons of history. By failing to do so, the West and free world are doomed to become history.